Metal Forging Lubricants are non-polluting and eco friendly products developed for matching up with the process application needs of forging industries. With the product being water soluble and graphite less, it comes with increment percentage stats from 30% up to 100% and helps in reducing wear down of dies through providing superior lubrication support. Other than this, the product also helps in bringing reduction in load levels on forging presses and hammers, thus making it preferred choice of customers from die and other related industries. 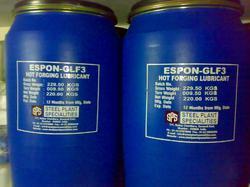 Some of the other benefits provided by ESPON-GLF3 hot forging die lubricant include no smoke emission, ensuring clean working environment with no presence of oil spills or graphite deposits on forge shop floor and others. This is water soluble type of lubricants is basically used in die industries. They are graphite less and that is one of the finest things initiating the application of Metal Forging Die Lubricants. They either can be used manually or in atomized way and by that they are offering more flexibility in the arena of application. In general shallow cavity types of die industries are using this product. In the manufacture we are focusing to maintain on the quality parameters which are fulfilling some international standards. Looking for Metal Forging Lubricants ?